2-4 hours before dinner: marinade pork: Combine gochujang, cider, vinegar, garlic, sage, 2 teaspoons each salt and whole peppercorns. Reserve half for later use, place rest into ziptop plastic bag with pork. Mix to combine, marinade for 2-4 hours. 45 minutes before dinner: Wash, de-stem, and tear kale leaves into bite size pieces. Dice the fresh apple, tossing in a small amount of apple cider vinegar to prevent browning. Set aside. Dice the cooking apple into small cubes (no need to peel). Add 3 cups water to a covered saucepan, bringing to a boil. Once water is boiling, add rice and reduce heat to low and simmer for 15-20 minutes (set a timer!) until water is absorbed. Pour reserved marinade into small saucepot on low heat. Simmer for ~15 minutes to reduce. Put grill/grill pan/however you intend to cook the pork chops on medium heat to preheat. In a large skillet, add 3 tablespoons oil over medium heat. Add the cooking apple to skillet and sauté for 3 minutes or until the apple begins to soften. Add the kale leaves to skillet and sauté over medium heat until the leaves begin to wilt, keeping the kale moving as to not burn, 3-5 minutes. Once kale has wilted and diminished in size, toss with 3 tablespoons cider vinegar and chopped walnuts. Season with salt and pepper. After rice has simmered for 15 minutes, remove rice from heat and let sit covered for 5-10 minutes. Remove pork form marinade. Grill/sear for ~5 minutes per side or to your desired level of doneness. Combine 1/3 cup apple cider vinegar, sugar, salt, and caraway seeds into microwave safe bowl. Microwave for 30 seconds, then pour over rice and fold in. Made this for thanksgiving and it was delicious! Marinating the pork in hard cider gives it a tangy flavor and makes it very tender. 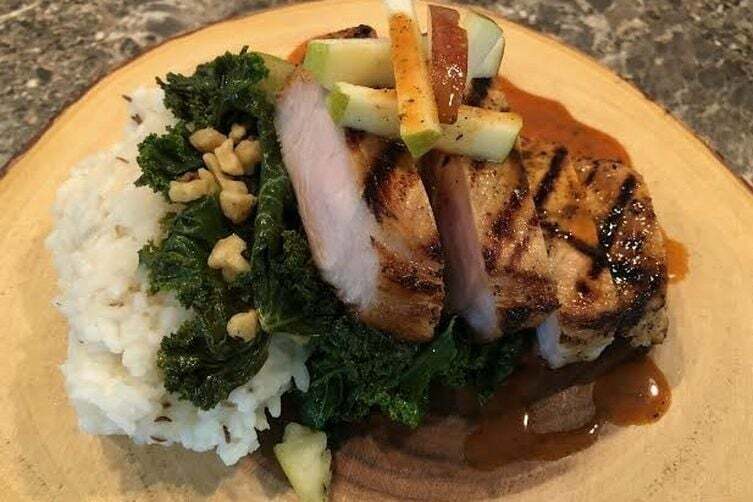 The sauce is spicy on its own but once you drizzle it over the pork and apples it adds just the right amount of heat. And the kale ties it all together with some earthy green healthy flavors.